Best wishes to all of you on the upcoming wiladat of the Lady of Light, Bibi Fatemah Zahra (SA). Today, we will be focusing on the four most perfect ladies in existence: Bibi Fatemah, Bibi Khadijah, Bibi Aasiya, and Bibi Maryam. Each circle of the flower has the name of each lady, and each petal has a fact about one of them. To create these flowers, the child has to match each name with the correct five facts, and then color/decorate as they wish. For a more advanced variation on this, you can ask each child to come up with the facts themselves to create their own flowers. 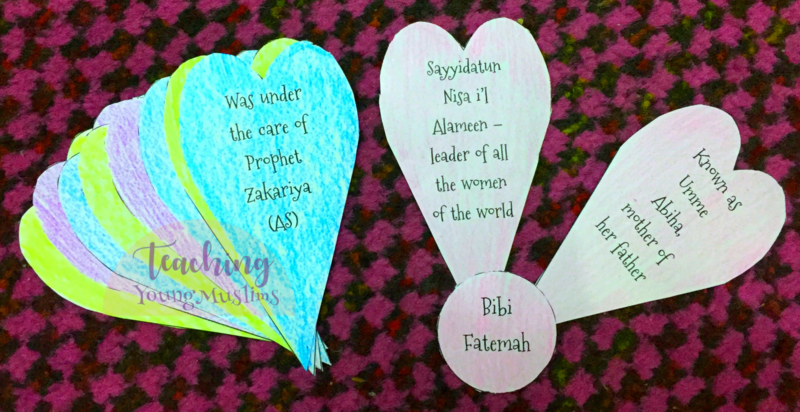 To download the flower cutouts, go to the Teaching Young Muslims Resource Library! Enter your name and email address here to receive the password to access these downloads.